The chairman of Peterborough United FC and former property developer Darragh MacAnthony, whose name once adorned MRI billboards welcoming potential buyers to ‘MacAnthony territory’, was back in Marbella this week to answer charges brought against Mac-Anthony’s MRI Property International by a group of about fifty former clients. The group, mainly British and Irish, say they paid 15,000 euros each for furniture packs for properties in Turkey, Bulgaria, Italy, Cape Verde, France and Morocco which were never delivered. Also appearing before the court in Marbella on Wednesday accused of fraud were Dominique Pickering, Sarah O’Callaghan and Nicola Shaw, all former MRI executives. Michael Liggan failed to appear. MacAnthony was questioned for two hours, during which he confirmed that MRI had received the money from the claimants but stated that the funds had been transferred to the furniture manufacturers, who never supplied the goods. Pickering, O’Callaghan and Shaw’s statements were all to the same effect. In support of this assertion their defence lawyers have presented a document – which to date has not been shown to either the judge or the lawyers for the prosecution – which apparently shows details of the bank transfers to the furniture providers. According to the lawyer Luis Fernando González Ordóñez, the Mac-Anthony property companies were effectively closed down without going into administration, with the only representative now being a 90 year old Spaniard, Fernando Arespacochaga Alcalá del Olmo, sole administrator of the Hispano-Peruvian company, Inmobiliaria Vasco Peruana SAC. Arespacochaga was also in court on Wednesday and stated that he had never had any direct contact with the other accused, and that he is still in receipt of 600 euros a month paid to him by MacAnthony for his services. The group of clients who accuse MacAnthony of fraud are claiming in total more than half a million euros which they say they deposited with MRI for the purchase of furniture. Most of the transactions took place in Marbella, in the MacAnthony offices which were housed in the building previously used as his ‘Club Financiero’ headquarters by the late Mayor, Jesús Gil. 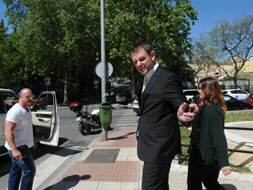 The Marbella judge will now have to decide whether to proceed with the case. This entry was posted in In the Media and tagged Luis Fernando González Ordóñez, Luis González Ordoñez, MacAnthony, MRI on April 28, 2012 by admin.